A homeopathic medicine for the treatment of malignancy. It helps post-operatively or after radiation therapy to improve the patient's general sense of well-being. It is used to treat growth and eczema that affect external and internal organs. It is beneficial in inflammatory and tropic rashes, anomalous epithelial growths and gives relief of the formation of scales and warts. - Naja tripudians: Regenerator of diseased tissues, suppresses carcinomatous growths, increases the defensive forces of the organism. - Scrophularia nodosa: Carcinomata, glandular swellings of a cancerous nature. The appearance of malignant and benign lumps in the breast, growing slowly into tumors. Stomach ulcers with a cancerous tendency. Myoma, uterine carcinomata, epithelial and scirrhous tumors. Usually 10-15 drops in some water three times daily before meals. If malignancy is suspected administer 20 drops in some water four times daily. 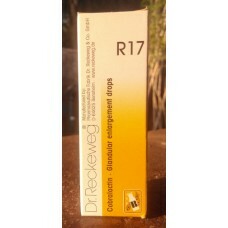 Reduce dosage gradually only after improvement sets in and continue medication for several months. The remedy is meant to be a supplementary medication in the treatment of malignancy. It is advisable to administer R17 post-operatively or after radiation therapy since it has been observed to improve the patient's general sense of well-being. 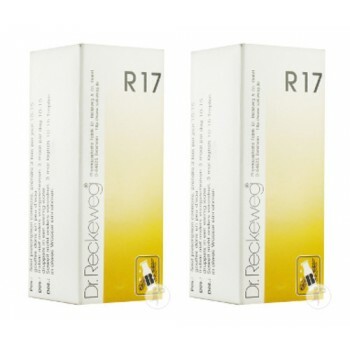 Severe paints in advanced stages of malignancy are frequently eased by the use of R17. Involvement of the female pelvic organs: additionally R38, respectively R39. In diseases of the prostate: see R25. 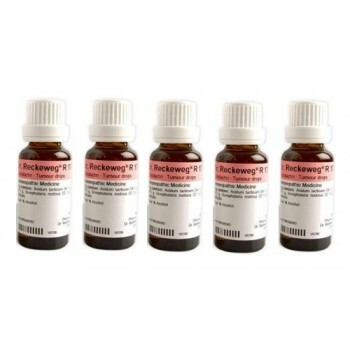 To stimulate hepatic function: additionally R7, 10-15 drops once daily. Natural products have a holistic effect on the body, treating not just the symptoms but the body as a whole, and may take time for absorption and results.You should allow several weeks to experience their long-lasting benefits. DR. RECKEWEG R60 - Purhaemine Blood Purifier 22 ml Indications: Impurities of the ..
DR. RECKEWEG R38 - Dextronex Abdomen Drops 22 ml Indications: Affections of the ovar..
DR. RECKEWEG R39 - Sinistronex Biotherapeutic in affections of abdomen left Drops 22 ml Indicat..